There may be heavier bands, louder bands, more obnoxious bands walking the earth these days like so many ill-fated, doomed-to-die dinosaurs, but none of them can hold a candle to Blue Oyster Cult. In their day, with their glorious first four albums, BOC brought intelligence to heavy metal, rooting the music firmly in rock's past while creating an invaluable blueprint for rock's future to follow. 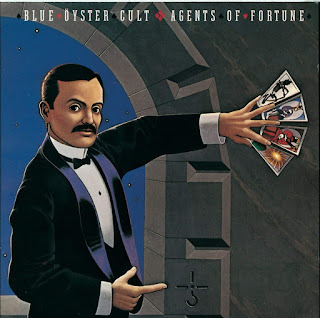 With the FM radio hits “This Ain't The Summer of Love” and “(Don't Fear) the Reaper,” Blue Oyster Cult broke through to the mainstream with 1976's Agents of Fortune LP. Reissued by Legacy in 2001 with cleaner sound courtesy of digital remastering, as well as bonus tracks and liner notes by Lenny Kaye, Agents of Fortune is unarguably one of rock's classic albums. Everybody knows the hit singles from Agents of Fortune, but only fans understand the depth of talent that BOC brought to their material. The band had three primary songwriters in guitarist Buck Dharma, bassist Joe Bouchard and keyboardist Allen Lanier. They introduced the world to Lanier's girlfriend, Patti Smith, who co-wrote the haunting “The Revenge of Vera Gemini” and “Debbie Denise” with drummer Albert Bouchard. Producers and managers Murray Krugman and Sandy Pearlman functioned as members of the band, adding to the songwriting chores and creating a unique sound that is instantly identifiable on any song as BOC. The material on Agents of Fortune runs the gamut from the hard-rock fantasy “Tattoo Vampire” to the radio-friendly musing on the afterlife, “(Don't Fear) the Reaper.” Alone among '70s heavy metal fiends, BOC had an enduring love and intimate knowledge of music and the artistic credibility that allowed them to add musical flourishes from influences as disparate as soul, jazz, and pop music. What other hard rock/heavy metal band could get away with adding the Brecker Brothers' horns to their songs as they did with the soulful “True Confessions”? The rollicking “Tenderloin” features gentle vocals and a fluid riff from guitarist Dharma and while “Morning Final” has a slight jazz feel behind a sordid story of fear and murder. This new version of Agents of Fortune also includes four bonus tracks, among them Dharma's original 4-track demo for “(Don't Fear) the Reaper.” A sparse, ethereal alternative take of “Fire of Unknown Origin” was recorded for the album but not used and an original demo for an Allen Lanier/Jim Carroll lyrical collaboration, the winsome “Dance The Night Away,” later recorded by Carroll. Although Blue Oyster Cult would maintain their popularity well into the 1980s, they are always recognized as one of the seminal bands of the '70s. If not for the ground broken by BOC with Agents of Fortune, much of today's hard rock heroes could not exist. As such, it's an album worth revisiting.